UAB DAGMITA performs diagnostic work life bearings, shafts, fans, and other dynamic rotor balancing of rotating components, gearing, belt and chain drives job analysis. • Adash A4300-VA3 is determined for bearing condition analysis, lubrication analysis and mechanical defects of machines – unbalance, misalignment, resonance, looseness. • Top-Laser SMARTY is an economical measuring device for the alignment of belt pulleys and chain sprockets. Through the use of this device, the wear of belt drives, bearings and seals is reduced. Less vibration is generated and the running time and reliability of the machinery are increased. 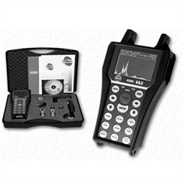 The software system DDS 2010 represents a very powerful tool to archiving and evaluating the data of the vibration and technical diagnostics. It supports Off-line as well as On-line measuring systems. In the full configuration it contains all functions necessary for data archiving evaluation and analysis.